Consumer sales and profits generally spike dramatically during the last two months of the year as the Christmas season is accompanied by a flurry of gift buying and giving — for better or worse. According to the Pew Research Center, the final yearly quarter of product transactions accounts for a third or more of annual sales by many types of retailers. A bad Christmas season of sales can mean the difference between profit and loss for the year. The same is true for livestock and hay producers, except the Christmas season comes with the first cutting of hay and continues through subsequent cuttings. Profit or loss is often dictated by when the crop is cut and how it is harvested. Unlike golf, there are no haymaking mulligans. 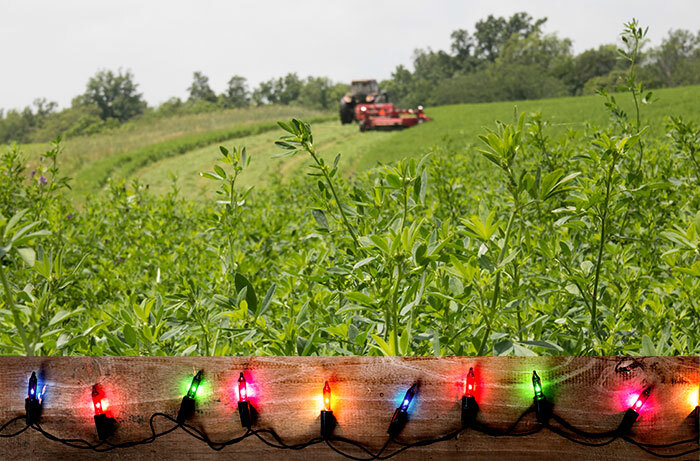 If the haymaking season is exemplified by the holiday season, then first cutting is Black Friday — a day that often dictates the success of the larger sales season for retailers. Though it’s only one harvest, first cutting generally comprises the largest percentage of total-season yield and, more importantly, offers the potential for both the highest and lowest quality forage of the season. A unique set of circumstances sets up first cutting for harvesting the most digestible fiber of the season. Top on the list is the cool weather that usually persists as the legume or grass crop matures, which slows lignin deposition and generally keeps fiber digestibility at peak levels compared to subsequent cuttings. How important is fiber digestibility? If you do the math, fiber digestibility is a big economic deal. There are three factors that will dictate the digestibility of fiber that is put into a silo or bale this spring: weather, plant maturity, and forage crop variety. That list is whittled down to two when we throw out the uncontrollable factor of weather. Timing of the first-cut harvest is where the focus needs to be now as fields advance in maturity. This is especially true for pure stands of grass or for alfalfa-grass mixtures. “Grass typically gains about one percentage unit of NDF per day in the spring,” Cherney writes in a recent Cornell blog post. “Alfalfa generally gains 0.6 to 0.7 percentage units of NDF per day prior to spring harvest. Rations can easily be balanced for protein and energy, but it’s not so easy to balance for fiber,” he adds. While NDF levels are ascending in the spring, NDFD is declining at nearly the same rate. Further, this rate of decline in fiber digestibility usually occurs faster than for subsequent summer growth cycles. A few days delay in cutting can mean the difference between great or good quality forage. A week’s difference or more may quickly fill storage facilities but also brings cordwood into the discussion. Needless to say, that’s not the situation you want to be in with a harvest that often comprises nearly 40 percent of the total-season yield in a four-cut system. At this point in time, there’s nothing that can be done about the alfalfa varieties or grass species that are planted to improve fiber digestibility. However, there is good reason why plant breeders and forage researchers expend considerable energy and resources developing improved varieties with greater fiber digestibility or, in the case of grasses, differentiating those species with the highest fiber digestibility. Investing in research-based alfalfa varieties or grass species that are superior in fiber digestibility is generally an easy payback. Even so, a timely harvest remains important. If weather delays a cutting, the improved plant genetics offers, at the very least, a wider window to ensure the harvest of acceptable quality forage. Here’s hoping you have a Merry Christmas this spring and summer with minimum lumps of coal.